I've read section 148/149 but I am still uncertain in this case. Can you legally pass a passing vehicle if all lines are broken and you can see it is clear and safe to do so? I've added a visual for understanding. Truck B is passing Truck C. Is it illegal for Car A to pass Truck B while he is passing Truck C if Car A can see the way is clear of oncoming traffic and no cross roads??? 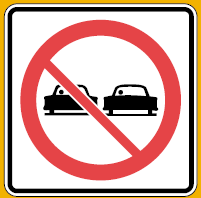 Car A and Truck B are both using oncoming lanes to pass as there are two lanes heading one direction and only one lane in their travelling direction.